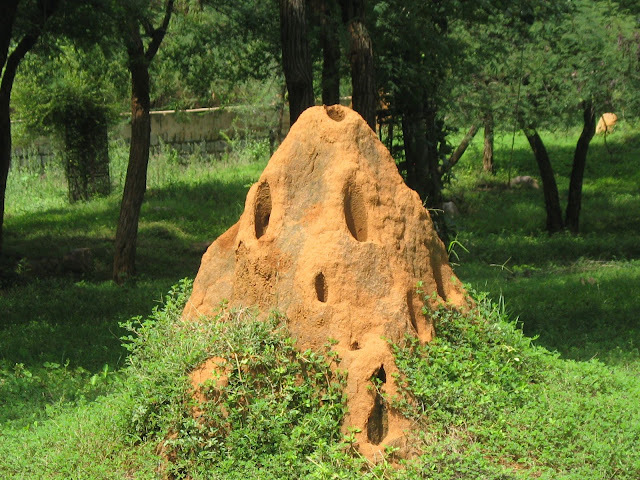 There is something fascinating about termite hills or termite mounds, (ant hills as we usually call them). You don't agree? Well, most of my family doesn't either, except Samhith of course! He has the same fascination for these huge settlements built with nothing but mud, and stops every time he sees one! Tirupati abounds in these termite hills - the Lord himself is said to have appeared in one, so undoubtedly there is something special about them! Well, we have seen many ant hills, some small, some even bigger than me.... See this one we photographed in the Zoo... Its about 5 feet high! We have often wondered what it would be like, inside this hill. It is believed that snakes live there too.... whether before or after the termites, I am not sure..... However, this time, the zoo not just gave us the opportunity to see some caged wild animals, but also some un-caged ones, among which were some termites - the hill had broken, probably thanks to some careless tourists - but we were able to see inside it as the termites swarmed all over! While I waved Samhith away and asked him to watch from afar, my mom wondered what attraction the repulsive creatures had for me..... as to my sister, you should have seen the expression on her face when I showed her these pics.... Now, tell me what you think about them! 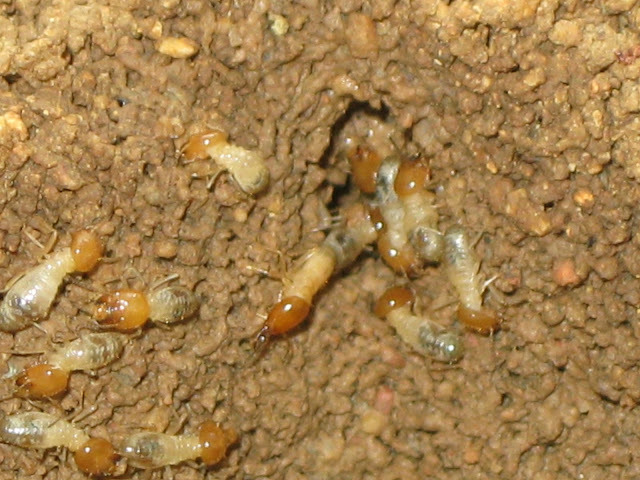 To know more about termites, click on the following links. you should get a job with National geographic!! Beautiful images... Looks a whole kingdom!! This world is full of innovative creatures!! 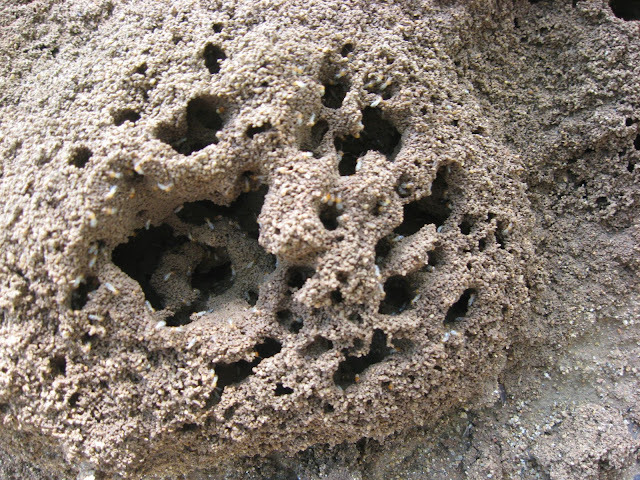 Termite hill of 5ft!!! 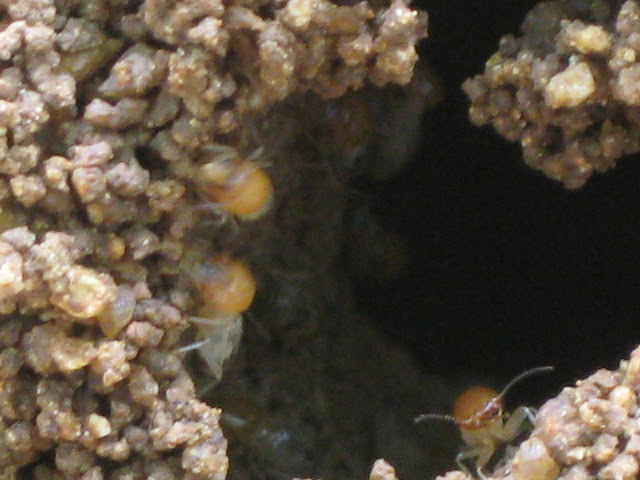 Lots of hard work by these tiny creatures with absolutely zero tool support. These structures are quite strong too. Infact the early day homes of Kerala had the same kind of walls (mud walls). Happy new year to you and your family !!!! nice photos and good info..
@Mridula: thanks.. usually she does, but she's really busy now, so should remind her to take a look! @Arti: thanks.....it is indeed an entire kingdom! Very interesting information. I simply loved your post.